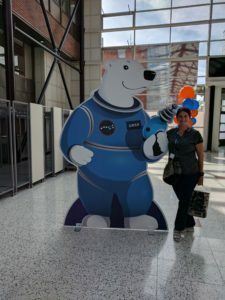 Back in August, I went to my first WorldCon, WC 75. I traveled with my mom and my sister. We went to Amsterdam and Stockholm before taking an overnight cruise to Helsinki and WorldCon. It was a fantastic trip. I found this lecture so incredibly useful for thinking about what to put in and what to leave out of a short story, and what order to put the pieces in. The Writing Excuses show notes also have a very helpful infographic to help visualize the information Mary covers in the lectures. What I can’t find is something to cover the same ground as the incredibly informative Self-Publishing panel that I went to. It was great. My mom and sister are not involved in publishing whatsoever and have no plans to ever self-publish anything, and yet they still found it interesting. (So, kudos to the guests and moderators for making it compelling even to some folks with no skin in the game!) Luckily, I took pretty detailed notes, so sometime soon when I have the time, I’ll type those up and post them here. This entry was posted in Uncategorized and tagged conventions, WorldCon, writing. Bookmark the permalink.